For a couple of weeks now, I have heard nothing but amazing things about this book, and so my biggest worry when I first picked it up was that I would end up being the black sheep who ended up being bored as heck by the book. However, then I figured that the worst that could happen was that I'd end up disliking the book, maybe suffering through it, or maybe even DNFing it. Turns out, I was dead wrong. No, that worst thing that could happen is that I start out thinking that the book won't do it for me, but then keep on reading, get attached to the characters, basically get a permanent rock stuck in my chest, and practically DIE when the feels hit. Reading this novel is one of the most painful experiences I've lived through, and I must say I loved every moment of it. 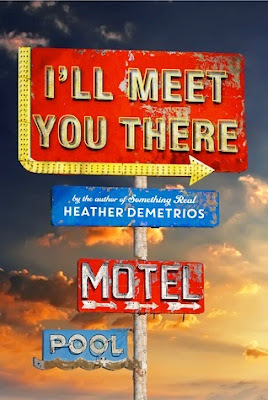 The book starts out in a tiny town called Creek View, and from the beginning, there is a gloomy, "I don't want to be here" feel to the story. We first meet the main character, Skylar, as she's going to Josh's homecoming party. Josh, he's a nineteen year old boy - man, really - back from the marines. And he's lost a leg. The last time Skylar saw him was right before she left, and she gave him a kiss on the cheek as a goodbye. It wasn't the romantic type of kiss, of course not, but of course we all know what that means. The introduction of these two characters just barely brings to the surface how messed up the duo is, and it's only as I got further into the story that realized how significant these two characters really are. Skylar was an amazing character to read about. She was innocent, but at the same time I've never seen anyone tougher. After her father died, her whole life got completely messed up, and she was beyond ready to leave to San Francisco, far away from her little town. However, when things got tough, she didn't run away, she faced them. She stuck by her beliefs, and always tried to do the right thing. She went out of her way to make Josh feel at home after coming back after the war even though she had no idea (it's loooooveeee). At times, believe it or not, I even felt jealous of her. She was literally perfect, with that unique combination of shy and forthright; she wasn't really afraid to put herself out there, and I envied that. She is an easy character to empathize with. Now Josh, he was like a storm rolling through the calm, little town. I have no experience whatsoever about soldiers, let alone wounded ones, and the descriptions in this book are so painful it hurts. It gave me a completely new perspective on soldiers, and for that I am eternally grateful. Josh is by far one of the most unique characters I've ever read about, and those short chapters in Josh's perspective are...terrible. He's a lost boy, trying to find out where he belongs, and that first image of him never really goes away. Seeing both his and Skylar's character development and romance is both heartbreaking and inspiring, and, well, in typical stern-talking Josh fashion, you really have to read this book. What's so great about this book is that it doesn't only deal with the romance between the two main characters. It brings up the painful things you don't really want to think about. There's the painful family dynamic with a self-destructing mother and a child who had to grow up too soon. There's the boy who came back from a war, back to a town where no one understands what he is going through. There is the friendship built on both love and mistaken ideals, and there is the emotions tangled up with poverty. This book explores all those themes that aren't usually at the forefront of a breathtaking romance, and that is part of what made this book so perfect. To be cliche, it is perfect in that it faces life's imperfections. I'm not one who is usually fond of contemporary novels - TFIOS was barely a blip on my radar - but I'll Meet You There is one book that EVERYONE needs to read. Even if you're only going to ever read one contemporary novel in your entire life, let it be this one. Not only is it an eye-opener to the completely different lives that other people, real people in this world live, but it is a poignant love story that will have you sniffling, if not all out sobbing. Speaking of, I definitely recommend some tissues if you're a crier. This novel is much too beautiful to put into words, but I'm hoping I got my point across that this is a MUST-READ that should be at the very top of your TBR list. That's an order. Book Synopsis: If seventeen-year-old Skylar Evans were a typical Creek View girl, her future would involve a double-wide trailer, a baby on her hip, and the graveyard shift at Taco Bell. But after graduation, the only thing standing between straightedge Skylar and art school are three minimum-wage months of summer. Skylar can taste the freedom—that is, until her mother loses her job and everything starts coming apart. Torn between her dreams and the people she loves, Skylar realizes everything she’s ever worked for is on the line.